Thanks to Flavius Josephus, we know a lot about the Jewish-Roman War. And thanks to the coins, we know how it was perceived by the Romans. On the example of coins from the upcoming Künker antiques auction 318, we recount what happened back then, and why it became such an important topic in Flavian coinage. Habent sua fata nummi: Every coin has its own destiny. First, it changes hands amongst those who pay with it. Then, it finds a home in the collection of someone who (hopefully) appreciates the piece and its significance. Heinz Thormann treasured coins. If you want to find out more about this remarkable man, please read our portrait about him. Gold plays a key role in Australia. It helped the former penal colony to become a serious country. Thus, a pattern for the first Australian sovereign, which will be auctioned off by Künker on January 31, 2019, is not only a numismatic highlight, but also a high-level testimony to Australian history. On January 31st, 2019, auction house Künker will sell the Dr. Gerd Gustav Weiland Collection of gold coins from Hamburg. One highlight of this collection is the abundance of gorgeous Bankportugalöser. They are closely connected to a trade city’s struggle against currency manipulations and to the founding of Germany’s first Girobank. On March 29, 1598, Adolf of Schwarzenberg reconquered the fortress of Raab, taking it back from the Turks. The Emperor was thankful: He elevated the victorious military to Imperial Count and thus made the House of Schwarzenberg an important factor in the Habsburg Empire. On January 31, 2019, the famous Trinity Medal created by Hans Reinhart the Elder will be auctioned off at Künker. This is a true masterpiece of German Renaissance medal art. Platinum coins rank among the great and most sought-after rarities of Russian numismatics. In their upcoming Berlin Auction, auction house Künker will offer a complete set of said rarities of exceptional condition, which once belonged to Georgy Mikhailovich, arguably the most famous collector of Russian coins. Magnificent coins from Cologne show the city’s patron saints: the Three Magi and Saint Ursula with her companions. Rich in relics, Cologne became a new Rome. We are exploring how this wealth of saints came about. In 1701, the Treaty of Hamburg ended the dispute over Mecklenburg-Güstrow between Friedrich Wilhelm I and Adolf Friedrich II. And another dispute culminated in the medals minted to mark the treaty, namely the one between the mint-master and the warden of the Schwerin mint. We tell you the story. On 8 October 2018, the first part of the Dr W. R. collection “Celtic world and Celtic money” will be liquidated in Künker auction 312. We use the ample material provided by the collection to present the history and the coins of the Celtic Treveri tribe. It is a collection that every German museum could be proud of, the collection of patterns and mint errors of the Federal Republic of Germany that Künker offers in auction 309. Following we present to you some of the rarest patterns and mint errors of Germany which can be found in the collection. Recte et constanter – uprightly and firmly, this is the motto under which the young empress Wilhelmine Amalia had taken up the reign. And uprightly and firmly did she act after her husband’s death as well. That is what is presented on an impressive medal offered at the upcoming auction sale 308 of the Osnabrück auction house Künker. For a few years during the English civil war, Oxford acted as royal capitol. This article presents an extremely fine "triple unit" of Charles I from this period in time, which will be put to auction in the upcoming Künker auction on June 21st, 2018. When talking about the Eighty Years' War, one usually encounters names such as Egmont, the Duke of Alba and the Prince of Orange. Alexander Farnese, however, who almost preserved Spanish rule over the Netherlands, is less known. We are telling his story by means of coins of the Geneart collection which will be auctioned off at Künker on June 18th, 2018. Four catalogues present the material of the Künker summer auctions from June 18-21, 2018. Among others, the auction will entail the Genaert collection with coins from the Spanish Netherlands, the Popken collection with coins from the House of Welf and the Gunther Wiegrebe collection with coins and medals from Lippe. In auction 304, the Osnabrück auction house Künker offers a series of early Persian coins showing portraits of kings and satraps, including four of the enigmatic tetradrachms of Athenian type with small portraits or Aramaic lettering. They are likely to have been produced under Persian orders for paying Greek mercenaries. On Wednesday, 21 March 2018, auction house Künker will auction off the Dr. Adelheid und Dr. Michael Loos collection of coins and medals from Mainz. This presents a great opportunity to tell the story of the city in medieval times based on the coins. An impressive gold medal of Catherine the Great, which will be auctioned off at the Künker Auction 306 on 23 March 2018, shows the magnificent view of a Moscow Kremlin Palace that never existed. Here is the explanation why. Saxonia in Numis is the title of auction 303 of the Osnabrück auction house Künker. It will be held as an eLive Premium Auction on 7 and 8 February 2018. If you collect Saxon coins and medals, you should not miss this auction. Saxonia in Numis is the title of auction 303 of the Osnabrück auction house Künker. It will be held as an eLive Premium Auction on 7 and 8 February 2018. If you collect Saxon coins and medals, you should not miss this auction. On 1 February 2018, Künker will auction off a testimony to the French-Russian alliance of 1892 in its Berlin auction. It is a gold medal dedicated to the inauguration of the Trinity Bridge in Saint Petersburg. This bridge was built as a symbol of this alliance and it has the Pont Alexandre III in Paris as its counterpart. With the Professor Helmut Hahn collection, Künker will offer an exquisite collection of bracteates in his Berlin Auction on February 1, 2018. These high-medieval pfennigs are first-class works of art and provide an insight into the thought of the time, for instance, how the Christian majority saw their Jewish fellow citizens. 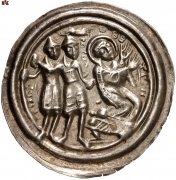 On occasion of the auction 250 featuring the Masuren collection on 2 July 2014, we published an article on the trading coins of Frederick II of Prussia. Since there is a 1765 bancotaler and a 1767 levantetaler in the Gunther Hahn collection, perhaps you would like to read this article again. On 2nd July 2014, the Osnabrück auction house Künker can celebrate a jubilee. It is going to conduct its 250th auction sale on that very day. It goes without saying that this calls for something special to be auctioned off: The Masuren Collection – Coins of the Kingdom of Prussia. It includes rarities of the Prussian coinage in the best state of preservation. That is a wonderful opportunity to look at the trade coins of Frederick the Great in detail. On February 1, 2017 the auction house Künker offers the top items from the Gunther Hahn Collection “Brandenburg-Preussen” as part of its Berlin Auction. They include some extremely rare coins of Joachim II who relied on Lipman ben Juda to conduct his financial transactions. The pre-sale estimate total for the 1,113 coins and medals to cross the block at the three Künker auctions on February 1, 2018 is 6.1 million euros. Besides precious rarities from all over the world, the material offered includes four top-class collections. Künker will auction a major collection of coins and medals related to the Reformation on September 27, 2017. Using this material, this article shows the extent to which politics of the past centuries used Luther and the Reformation jubilee for their own purposes. Gold coins minted right before the outbreak of World War II? Commemorative coins on the 100th anniversary of King Carol without a single reference to the ruler? You have to know the historical background to understand why Carol II had these coins commissioned in 1939. The scene Andreas Vestner has recorded on a silver medal produced by order of Karl Wilhelm Friedrich of Brandenburg-Ansbach is impressive to see: The Chancellor of Saxony is reading out the Augsburg Confession. But why did the ‘Wild Margrave’ of all people commission this medal? On Friday, 29th of September 2017 from 2.00 p.m. on, at the Steigenberger Hotel Remarque in Osnabrueck, with auction 299 there takes place Kuenker’s 14th phaleristic vendue with more than 440 lots. There are being offered orders of chivalry, decorations, medals and badges, mounted medal and miniature groups, certificates and documents from Germany, Europe and all over the world, from the 17th century up to present time. On 29 June 2017, a very rare commemorative coin of the abbess of Quedlinburg will be put to auction at Künker sale 294. It is dedicated to the Reformation jubilee of 1617, but the question arises, where people got the idea to celebrate the jubilee in the first place. On 13 May 1717, roughly 300 years ago, Maria Theresa of Austria was born. Could there be a better reason to introduce the coins of Frederick II's arch enemy on the basis of a few lots from the upcoming Künker sale from 27 June to 29 June 2017? From an etymological perspective, reading, picking things up, and collecting are corresponding phenomena used to grasp the world’s order. In this sense, Werner Bröker always saw his passion for collecting stamps, documents from Westphalian Postal history, and coins as a way to better understand the world – and one’s own place in the world – to make that world accessible and, in both the material and the intellectual sense, to adopt it and thus to give meaning to and define one’s own identity. Bernhard Terletzki, who was born according to his mother’s wishes was in 1932 in Hamburg (it was intended that he should become a true citizen of Hamburg), has his actual roots in the small city of Wartenburg in the district of Allenstein, today called Barczewo, in the Southern part of the former East Prussia. He was only 12 years old when, at the end of the Second World War, he was forced to leave his beloved East Prussian home with his seriously ill mother and two younger siblings. The family found a new place to live in in Schleswig-Holstein. During this time of hardship for most Germans, the young Bernhard had to take on much responsibility; his father was only later able to return to the family. After attending preparatory secondary school, Bernhard Terletzki initially undertook a training program, in order to subsequently begin studies to become a foundry engineer. This professional course eventually took him to the industrial Ruhrgebiet region. An impressive gold medal that is being put to auction on 16 March 2017 with Künker conveys the official version of a story, we are more likely to know from folk songs, novels and the cinema: On 16 April 1746, Bonnie Prince Charles was defeated in the Battle of Culloden. An impressive gold medal that is being put to auction on 16 March 2017 with Künker conveys the official version of a story, we are more likely to know from folk songs, novels and the cinema: On 16 April 1746, Bonnie Prince Charles was defeated in the Battle of Culloden. Künker Auction 289 will offer the first part of the Ottoman Collection on March 14, 2017. This collection bespeaks the sometimes difficult relations between the Western World and the Ottomans. We are singling out one chapter: The quarrel about the legacy of Louis of Hungary and the first Siege of Vienna. On March 13-17, 2017 Künker will hold its Spring Auctions. The entire numismatic spectrum will be covered. Furthermore, several specialized collections will be auctioned off. The collectors of medals in particular will find something of interest. In the upcoming auction of Künker on 13 March 2017, several interesting aurei are going to be put to auction. They are Indian imitations of Roman gold coins, which bespeak the close trade relations between Rome and the Indian subcontinent. On the occasion of Künker Auction 286 "Coins from the Swedish Possessions - The Ottar Ertzeid Collection", we present you an issue from 2014. On March 13, sale no. 247 of auction house Künker offered the Baums Collection featuring historical medals. The connoisseur discovered many historically interesting, artistically enchanting medals, like a piece that was created by Sebastian Dadler on the occasion of the funeral of Gustavus II Adolphus of Sweden at Riddarholm Church. The upcoming auction 286 contains a 4 ducat piece with was strucked according the Sebastian Dadlers's artwork. In its Berlin Auction 286, the auction house Künker auctions off the Ottar Ertzeid Collection with coins from the Swedish Territories. The offer includes a series of Purim talers. In this article, we address the question why the Protestants of Erfurt took a Jewish festival, of all events, to date their coins. Habsburg coins having been minted in the Prague Mint is something we very much take for granted. In its Auction 285, to be held on 2 February 2017, the auction house Künker offers an entire series of these. But it was anything but ordained by God that Bohemia became subject to the rule of the House of Habsburg. As part of its Berlin Auction 285, the auction house Künker offers a Congressional Gold Medal. This is no medal like any other, but the one President Madison handed personally to Alexander Macomb, the Hero of Plattsburgh. We are telling his story. 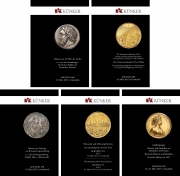 On the occasion of its Berlin Auction, Künker presents three auction catalogs: Catalog 285 with exquisite German and world coins, Catalog 286 with the Ottar Ertzeid Collection featuring coins from the Swedish Possessions, and Catalog 287 with the Toni Barth Collection with German coins since 1871. Napoleon was a master in the art of humiliation. Please find here a characteristic example of his mastership: The French Victoria is taming the Saxon Steed on a medal made from Saxon silver. 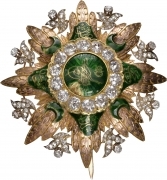 The medal stems from the estate of the Bonaparte family and will be sold as part of the Preussag sale. On 1 November 2016 the second part of the Preussag collection will be auctioned off by London Coin Galleries in cooperation with Künker in Osnabrück. 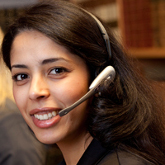 The material comprises 772 lots of mining coins, estimated at 630,000 GBP altogether. The one-time “Preußische Bergwerks- und Hütten- Aktiengesellschaft”, later known as Preussag AG and today as TUI AG, was founded by the Prussian government in 1923 and united, as a public enterprise, the mining and metallurgical operations in the possession of the Prussian state (with the exception of the Ruhr district’s coal fields). Following the annexation of the Kingdom of Hannover in 1866 by the Kingdom of Prussia, the majority of the mining and metallurgical works in the mountainous Harz region which had been operated under the centuries-old Guelph mining tradition became possessions of the Prussian state. The city of Hamburg had a problem. All ships that intended to use its port and, in order to do so, went up the Elbe River, passed territories the Danish king made a claim to. He was not only King of Denmark but, being Duke of Schleswig and Holstein, also strongest power in the Lower Saxon Circle. Around 1600, coin collecting was “the” leisure activity of the intellectual elite. The emperor himself was an avid collector. He was imitated by many noblemen among them Philip II of Pomerania, who put together a great art collection in cooperation with Philipp Hainhofer. Don’t think only confirmed fools believed in the wonders of alchemy! On the contrary. The smartest men of the early modern period kept themselves busy with the queen of the sciences, the doctrines of separating and combining, of cleaning and mixing, of the philosopher’s stone and the elixir of eternal life. Coins featuring the portrait of Brutus are extremely rare. Coin portraits of Cassius, even more so. Thus far, there is only one known coin type which probably depicts the staunch Republican. In the forthcoming Künker Fall Auction 280, you can come face to face with both assassins of Caesar. On June 23, 2016, Künker is going to auction off a so far unpublished willow tree coin. The reverse of the 10-ducat piece depicts a willow tree in a storm. But what did the minting authority, William V, wish to express here? And what do trees on coins signify anyway? “Made by Maria” can be read in Russian on the reverse of a medal, which will be auctioned off on June 21st, 2016 at Künker. It is remarkable, that a woman created these dies, and the story gets even more interesting, knowing that this die cutter was a Russian czarina. No other period of the Roman Republic generated more innovative imagery than the civil war between Octavian, Marc Anthony and Sextus Pompey. During the upcoming Künker Fall Auctions of 2016 a splendid testimony to this thesis will be auctioned off. Sextus Pompey created an aureus referring to his father, Pompey the Great and his brother, Gnaeus Pompeius. For centuries the mines of Goldkronach were extremely profitable. But then their abundance ebbed away. The Bavarian Kings were not willing to accept that and planned huge investments. A coin will tell you, what happened then. On February 6th, 2016, 42 Chinese coin dies and 36 punches from the holdings of Otto Beh’s company will be handed over to the state coin cabinet of Saxony-Anhalt. They attest to an exciting chapter of German history of technology. On February 4th, 2016, Auction House Künker will offer a gold medal, commemorating, what probably is, the most important military success of Peter the Great: his victory at the Battle of Poltava, which changed the course of the Great Nordic War. On February 4th, 2016, Künker will offer a French 5 franc gold pattern of year 10 for sale. The type can be traced back to the French Directory and it was only changed when Napoleon was certain of his power. On February 4th, 2016, Künker Auction House, during its Berlin auction, will offer an extensive series of pre-1871 German rarities. Among them, there will be an extremely rare taler of the count of Veldenz. The oldest löser date back to the year 1574. They are fascinating specimens. Responsible for the coinage is Julius of Brunswick-Lüneburg (1568-1589). He was an exceptional figure in the 16th century. Suffering from a walking disability and once destined to become a priest, he took over his father’s territory due to the death of his older brother. In cooperation with London Coin Galleries, auction house Künker presents a part of the former Preussag collection at its auction on 30 October 2015. Some of the objects provide unique insights into how noble metals were mined and traded. A medal, minted on behalf of the great Elector Frederick William of Brandenburg himself, remembers the means that were devised to fuel the realm’s economy. The regent of Prussia ordered the founding of a trading colony for the purpose of acquiring slaves, ivory, and gold. To regard coins of the early modern period merely as currency completely overlooks an important fact: their role as courtly representations of the renaissance ruler. As you have probably already heard through the daily press, the German Minister of State for Culture and Media, Monika Grütters, is preparing an amendment to the Act to Protect Cultural Property Against Removal in Germany. This proposed law is very controversial, not only because of its content, but also because of the very one-sided debate which has accompanied the legislative process. Although the concerns of the trade and the collectors were heard, their relevant arguments have not at all been taken into account considering the proposed law. Peter III had ruled Russia for just six months. For this reason virtually all of his coins are rare. Künker will offer a very rare 10 rouble piece of that ruler in his sale 264 on June 25. It depicts Peter Prussian-style. On June 24, 2015, Künker auctions a small series of portugalöser from the city of Hamburg. They are strongly associated with both the fight of a Hanseatic city against currency manipulations and the founding of the first Giro bank in Germany. As part of Auction 292, Lot 8133 contains a die of the reverse pattern of the first commemorative coin of the Federal Republic of Germany “Germanic Museum”. On the occasion of Auction 264, conducted on June 25, 2015, we did some research on the history of this pattern of which we offered a specimen at that auction. On Thursday, March 12, 2015, the auction house Künker auctions off an unusually rare testimony of the Maltese history. The small silver ingot in the weight of 30 tari from 1800 is the last currency produced on Malta. On Friday, March 13, 2015, Künker auctions off a Siculo-Punic coin with an enigmatic depiction: on the obverse we see a beautiful woman with a Phrygian cap. Is it Dido? Is it Tanit? Or is it perhaps a completely different goddess? One highlight of the World Money Fair, which opens its doors in our capital today, ended yesterday evening: our 10th Berlin Auction provided an array of exciting numismatic moments. The yields from the individual items are truly impressive. In 1694 Frederick Augustus I ascended the throne as Elector of Saxony, when his brother Johann Georg IV died surprisingly after reigning for only three years. Augustus the Strong, as he liked to call himself, was well educated for the tasks which awaited him. He had benefited from outstanding teachers, had traveled the world for three years with his eyes wide open, and had even proven himself as a military commander. Anyone who, during the 60s decade of the previous century, took part in one of the larger English horse auctions may have been surprised to learn that calculations there were still made in guineas, in spite of the fact that the last British guinea had been minted in1813. Nonetheless this denomination stood, like no other, for the aristocratic attitude towards life in Great Britain as the nation grew into its role as administrator of a worldwide empire. Carolina, Georgia, California – A great many people were lured by the prospect of easy riches in the gold fields to set out for the unknown. Consequently, the Gold Rush has become one of the seminal myths of the United States of America. In its Berlin auction Künker offers a range of numismatic testimony to this eventful era. It took Künker in Osnabrück six days to sell all the 9,451 lots of their auctions 253 to 257 featuring coins, medals, banknotes, coin scales and much more. The total estimate of 7.9 million euros rose to 11.4 million euros total hammer price. 3,200 bidders participated in this event, either in person, by placing the bid by letter, telephone and via the internet. They all made sure that every rarity was recognized as such. This is the only explanation for the fact that an unimpressive Russian decoration presented to officers having participated at the Capture of Ismail on December 11, 1790 – which was not even an original but a restrike made in the 19th century – rose from 5,000 euros to 100,000 euros in the end. One thing is for sure: collectors are the experts when it comes to acknowledging the rarity of a specimen. Another exciting auction-week came to an end on Friday evening with our sale of ancient coins. With an over all hammer price of 11.4 Mio € the Künker Fall Auction 2014 went nearly 50 % over the estimated price (7.9 Mio €).